Okay... here is my cover. Placeholder. To be filled in... 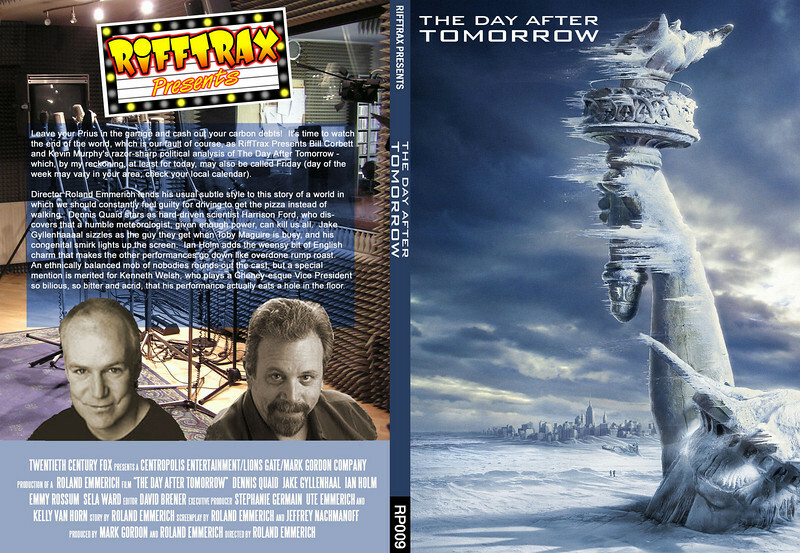 The Day After Tomorrow! Oh look i made it! So, since I do nothing but play with Photoshop all day at work and get paid for it... I decided to stop mooching off other peoples' artwork and make my own DVD covers. But I have one question... are there any rules as to what I NEED to put on my covers if I post them here?? Like, I am going ultra-minimalistic on these, but thats how I like them. If I don't HAVE to include extra certain info on them aside from the title and the fact that it's rifftrax and who's on it, then I'm good to go. Just wondering so I don't get chewed out for leaving specifics off of my covers. - Riff number at the bottom of the spine (ie RT-063 for rifftrax, RTP-011 for rifftrax presents). I think there has been a general agreement as to where we are in the sequence, look at covers by Ortega, MrTorso, Axnollouse. And in honor of Hurricane Ike, another natural disaster of a cover. Slowly getting the backlog done. Click the preview for the full resolution version. and Full-Face Label if anyone wants it. I don't follow the rules of riff numbers. Instead I use what the Rifftrax people use as their lists (i figure that's the most official list). You can find it on their "all products" page. Look forward to seeing a new face here! By the way, I get internet tomorrow.... so my cover is coming soon. It's sad, not many covers in here yet! I was able to snag your cover before it disappeared..
After uploading it.... I saw some minor problems.... those have been fixed and reuploaded. Enjoy! I'd recommend re-downloading it. I was wondering what was up with Kevin in the kid's halloween costume, but it totally works on the cover. I'm still waiting for one of those thinpak covers with the format I really like... Axnollouse? Ortega? MrTorso?